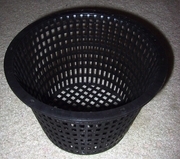 Here is a super sturdy medium sized small weave net pot.. perfect for all kinds of orchids and growing conditions! Weave is small enough to hold in traditional orchid mixes, yet large enough to allow roots to meander around inside and out. This pot is also incredible sturdy, and has holes in the top for hanging with a wire hanger. Can easily be used in hydroponic growing as well!